Beck’s gracious attitude about winning Best Album of the Year for "Morning Phase" over Beyonce isn't appeasing the angry BeyHive one bit -- and the evidence is written all over his Wikipedia page. Following the alt-rock icon's fifth Grammy win, loyal defenders of Beyonce took their rage to Wikipedia and gifted him with a few new titles. Among them: Thief, stealer, and life ruiner. Looks like Kanye's rush-the-stage stunt and E! 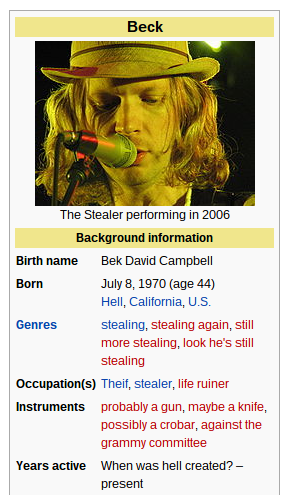 interview were merely the beginning of a long and brutal cyber-war: One generous Wikipedia user decided that Beck was likely active when Hell was created, while others are having a bit more trouble figuring out who Beck is altogether (#WhoIsBeck) or have chosen to dwell blissfully in a Beck-less world.